Few things are more satisfying than a warm burrito, filled with melty cheese, meat, rice -- whatever your heart desires -- on a cold winter day, or ever really. But if there’s one thing that actually is more satisfying, it’s getting said warm burrito for only a dollar. Taco Bell recognizes that and their new Cravings Value Menu is (almost) here to satisfy your burrito cravings for cheap. Like, extremely cheap. The fast food chain announced the full list of items rounding out the unified value menu, featuring new $1 Grande Burritos in two varieties: Chicken Enchilada and Three Cheese Nacho. Basically, T-Bell’s value menu just got bigger and better. 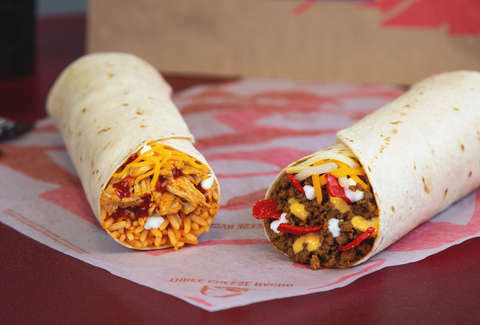 The Chicken Enchilada Burrito, which is made with seasoned rice, shredded chicken, red sauce, sour cream, and cheddar cheese wrapped in a flour tortilla, while the Three Cheese Nacho Burrito combines beef, nacho cheese sauce, red tortilla strips, sour cream, and a three cheese blend inside a warm tortilla. Considering the chain’s proclivity for tossing its usual ingredients together to create foods in new shapes and sizes, the burritos are far from the only options on the Cravings Value Menu. It also includes tacos, like the Spicy Potato Soft Taco, Cheesy Bean and Rice Burrito, and Beefy Fritos Burrito; Triple Layer Nachos; Cheesy Roll-Up; Spicy Tostada; Shredded Chicken Mini Quesadilla; Beefy Mini Quesadilla, and more for, again, $1. The company will also be rolling out $5 boxes as part of their unified value menu, but they’ve yet to reveal the juicy details about what’ll be included. It’s likely to be revealed closer to the Cravings Value Menu’s official debut at location across the country on Thursday, December 27.